Cancellaresca (or Chancery Cursive), the origin of Italic as we know today, was developed during 15th Century Renaissance in Italy. The new design of letters allowed scribers to write at better speed than ever before, and soon Cancellaresca became popular all over Europe. Cancellaresca had been refined through hundreds of years and inspired many type designers in modern world. Italic (from Latin Italicus) means "Italian", "of Italy" or "from Italy". Earlier (1570s) the word was used in English for the plain, sloping style of handwriting (opposed to gothic), and italic printing sometimes in English was called cursive (and also Aldine). Often, but not always, for emphasis; in manuscripts indicated by an underscored line. 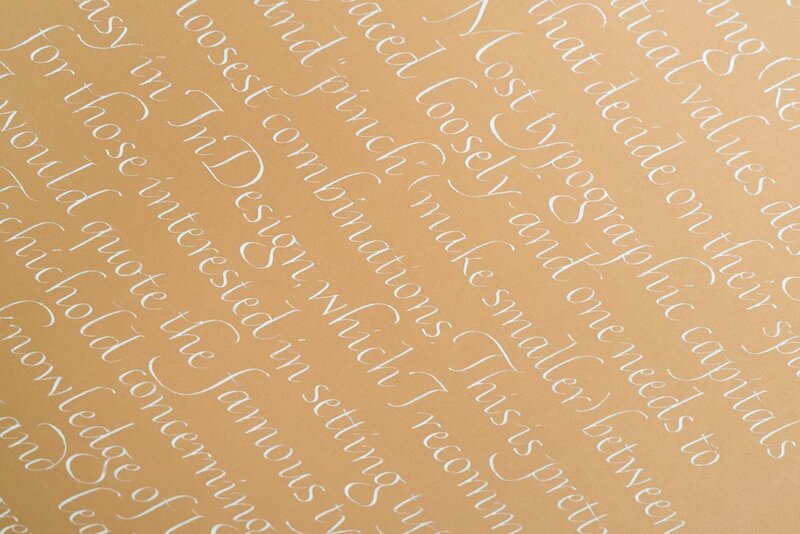 In this workshop we will study the basic letterform of Italic and move on to more flourished - lively form. We will start from historical principles, then explore possibilities of hand tools, materials and gestures to express ourselves into the art of lettering. Platt Roger Spencer, whose name the style bears, developed his script since 1840. He used various existing scripts as inspiration to develop a unique oval-based penmanship style that could be written very quickly and legibly to aid in matters of business correspondence as well as elegant personal letter-writing. Soon after Spencerian became popular all over across the United States and was considered the standard of American cursive handwriting until the 1920s when the spreading popularity of the typewriter rendered its use as a prime method of business communication obsolete. 1860s-1920 is the Golden Age of Penmanship in America. Spencerian was continuously developed by generations of greatest penmen and refined to an art form of human hand expression: Ornamental Penmanship. Ornamental Penmanship was no longer a name of one specific calligraphy style, but a name of glorious technique of pointed pen, which represented the most elegant and graceful in handwriting at that time. In this workshop, we will explore how to write Spencerian that was popular in Golden Age and study how it was different to old school Spencerian.